You Do The Math: Ten at Twenty in 2010? Home / Figure Skating News / You Do The Math: Ten at Twenty in 2010? Canada's Jeremy Ten hopes to make the 2010 Olympic team which will be held in his hometown of Vancouver. Jeremy Ten is on a mission. The 2007 Canadian Men’s Junior Champion wants to skate in the Olympics in his hometown of Vancouver, British Colombia, in 2010. Should Ten make the olympic team, he will be twenty years old when marching in the opening ceremonies. If ever there was an athlete destined for something special, it could be argued that Ten has irony going his way. The Canadian-born Ten, son of immigrants from the Southeast Asian country of Brunei, began skating when he tagged along to his older brother Nick’s hockey lessons. Originally, Ten planned to follow in his brother’s footsteps into the world of hockey. However, upon realizing that he was too small to hit a puck let alone hold a hockey stick, Ten turned to figure skating instead. By age nine, Ten was taking private lessons from his first coach, George Yuhas. Last year, Ten began the season by winning the bronze at a Junior Grand Prix (JGP) event in France. He just missed the podium in his second JGP assignment in The Netherlands. As a result, Ten was listed as the third alternate to the JGP Final, and did not receive the call to participate. As the 2006 Canadian Junior silver medalist, Ten was the favorite in the men’s junior division heading into the 2007 Canadian Championships in Halifax. After the short program, Ten stood in second place after making an error on his triple lutz combination. But Ten was able to recover to convincingly win the gold medal outscoring the silver medalist by more than 19 points. Ten describes himself as a balanced skater who strives to have the label of “all-around skater”. Though Ten admits that the jumps have always come easy for him (he learned the triple lutz in just two weeks), he is most proud of his ever-improving spins. 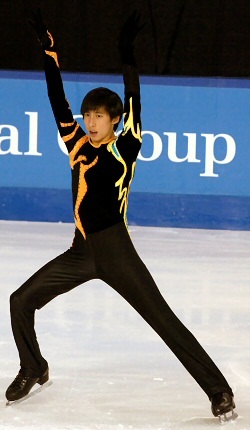 Though Ten still does not consider spins to be one of his stronger elements, he is nevertheless excited about the progress he has made in that area of his skating. To prepare for the upcoming season, Ten has continued his longtime partnership with coach and mentor Joanne McLeod. Ten has also decided to retain the services of celebrated choreographer David Wilson to round out his support team. Ten will continue to skate on the junior level internationally in the fall, but will move up to the senior ranks for the Canadian Championships in January. Ten’s first goal is to skate as well as he can in the Junior Grand Prix so that he can earn a trip to this year’s final, and to also get a ticket to the World Junior Championships to be held in Sophia, Bulgaria. In order to make himself more competitive, Ten is committed to adding the triple Axel, a jump that he has yet to complete in competition to his arsenal this season. At his first senior nationals, Ten hopes to place in the top eight, but believes that top five is not an unrealistic goal. A recent graduate of the Magee Secondary School, Ten plans to attend Simon Fraser University in Burnaby, British Colombia in the fall, but is unsure as to what his major will be. Outside of school and skating, Ten likes to listen to music, and is fast growing interested in dance. In fact Ten is planning to enroll into a dance academy later this summer to begin studying ballet and hip hop. For now, Ten will work to meet his lofty goals for the season by paying careful attention to improving the levels and grades of execution on his spins, mastering his difficult Wilsonian choreography, and calculatedly throwing his body in the air in hopes of perfecting that triple Axel. But the irony is seeded somewhere in the back of his head. Could twenty-year old Ten be the hometown hero in 2010?